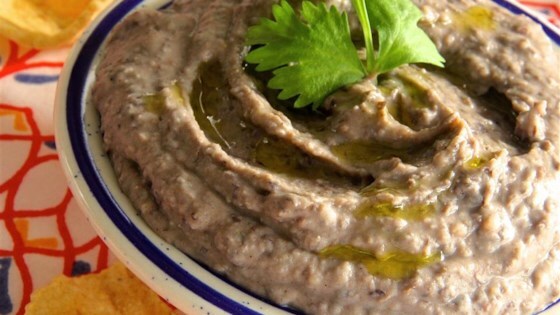 "Black beans make a delicious and healthy alternative to the usual garbanzo beans in hummus. This recipe is a crowd-pleaser and a nice staple at any gathering. Your vegetarian friends and family will thank you! If you have any roasted veggies on hand those also make a great addition blended in to the hummus!" Blend black beans, garlic, lemon juice, tahini, cumin, salt, and black pepper together in a blender. Pour olive oil into blender in a steady stream until desired consistency is reached. You can substitute 2 teaspoons crushed garlic for the fresh garlic, if desired. You can reserve and use some of the bean liquid mixed with the olive oil to cut down on fat content, if desired. This will keep in the fridge for 2 to 3 weeks. So good! Next time I will use my food processor instead of the blender. So, so easy and yummy!! I did not have tahini so I used sesame seed oil.